Today was the perfect day to get out to the Farmer’s Market. I scored some fantastic veggies ~ Heirloom Tomatoes, Cherry Tomatoes, Squash, Pluots and both Red & Black GRAPES. In addition to all the fruit/veggie/hummus samples I had at the market, I had leftover POM Chicken, brown rice and roasted green beans for lunch. I actually only managed to eat all the green beans and rice plus about 1/3 of the chicken before I was full. I thought of finishing but figured it would be better to be “mindful” and listen to my body. This afternoon I found TWO ways to ruin my appetite for dinner. I had a slice of the Cinnamon Swirl bread that I picked up for my co-worker at the market. Seriously….who can resist this and say no. Then, when I got home I was super excited to share the Lemon Herb Pita Chips and Hummus with The Husband. He doesn’t do pita bread, but, he LOVES pita chips. These chips are amazing. I had two by themselves and three dipped in hummus. At this point, I was pretty much NOT hungry at all. However, I was planning on making up a bunch of food for The Husband tonight because he will be asleep by the time I get home tomorrow. In my quest to clear out the pantry (get rid of the old because the new pantry is almost ready!!! ), I decided to make a new to me Trader Joe’s Cheddar Cheese Potatoes. Eh…not too bad on the nutritionals, but, the ingredient least can be improved…..
All cooked up and cheesy looking. The Husband was sure I was trying to make him eat sweet potatoes (he doesn’t like them at all) LOL. I LOVED these potatoes – they remind me of growing up. The Husband thought they were ok, but, he said he liked my homemade healthy version better LOL. While the potatoes cooked, I grilled and grilled and grilled. Don’t worry, this isn’t all for me! I also grilled up some corn on the cobb and sliced up one of these beautiful heirloom tomatoes for our veggies. Seasoned with a little sea salt & pepper ~ So good! I think I could have eaten the entire tomato myself. And a serving of Cheesy Cheddar Potatoes….I might have snuck another bite as I put them away. I wasn’t super hungry but knew I’d wake up starving if I didn’t eat. I am off to read, relax and get caught up on the sleep I missed out on last night. That is one advantage to The Husband going to bed early….I tend to as well. « Red Pepper Eggwich for my new RED site! The nutrition on that hummus is outstanding. is there anyway you can buy that in the stores, or is it just a farmers market find? So nice that you prepped some food for you husband while you’re gone. Those pita chips look delish. I make my own hummus, and it’s sort of hard with a blender, but it is much cheaper! This is a “drool-worthy” post! Everything looks so good! The pita chips really caught my eye…I never see pita chips in “exotic” flavors around here….just plain! wait girl so, have you had BBQ recently?! 😉 i know, im such a little punk. 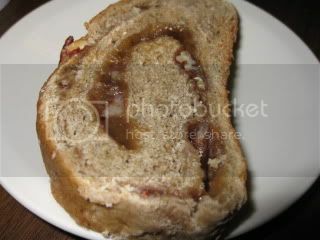 I would be all OVER that cinnamon swirl bread – oh, yum!! Also I love those pita chips – what kind are they? Emily ~ I have made my own but it never turns out as creamy as the places you can buy it from. I even use a food processor – I wonder if there is a tip to make it that way…. Becci ~ I LOVE Pita chips even in plain…but, there is just something to be said about homemade pita chips – AMAZING! K ~ The Hummus Guy sells the Pita Chips too – homemade pita chips – they are Lemon Herb and sooooo good. I shouldn’t have bought them because they call my name ALL day.